UFC is gearing up for UFC 235 Pay-Per-View (PPV) event which takes place this Saturday night (March 2, 2019) from inside T-Mobile Arena n Las Vegas, Nevada. 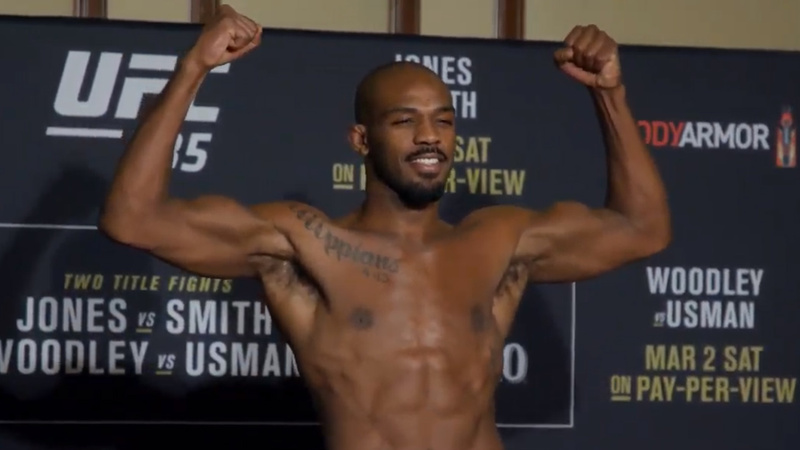 In the main headliner, UFC Light Heavyweight champion Jon Jones will put his title on the line against Anthony Smith. Last December Jones successfully captured the 205-pound title after knocking out Alexander Gustafsson at UFC 232. Meanwhile, Smith has scored his first-ever shot at the championship after defeating top names like Rashad Evans, Mauricio Rua, and Volkan Oezdemir. The co-main event features another title fight where UFC welterweight titan Tyron Woodley will look to defend his crown against Kamaru Usman, as well former Bellator champion Ben Askren making his Octagon debut against Robbie Lawler. UFC is holding a weigh-in event today at 12.pm ET where all the fighters will step on the scale to make weight for Saturday’s fight. The ceremonial video will start at 7.pm ET.